Call this one a classic beach read novel. 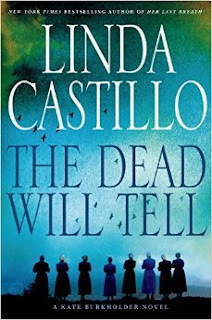 This is book six of Linda Castillo’s Kate Burkholder series. For those, like me, who came in late, Burkholder is chief of police in Painters Mill, an Ohio town analogous to Lancaster, Pennsylvania in that it’s in the middle of Amish country. Kate is perfect for the job in that she grew up Amish and speaks their special Deutsch tongue. Tag line: She gave up her bonnet for a badge! Kate is an intuitive crime solver, not a hard-broiled detective; in fact, I imagined her as a bit like Marge Gunderson from the movie Fargo, except Kate has a damaged lover, former state agent John Tomasetti, whose family was murdered by vengeful mobsters. Family murder is at the heart of The Dead Will Tell, whose mysteries begin when an elderly businessman is found hanging in a barn. It looks like a suicide, except that the corpse also has a slug in him and an Amish peg doll rammed into his throat. Other pillars of Painters Mill begin to receive notes bearing messages such as “I know what you did” and “You were there.” As the body count and peg doll counts rise, Kate begins to think these events may be linked to a thirty-year-old unsolved crime: the murder of Amish woodworker Willis Hochstetler, the abduction/presumed assassination of his wife Wanetta, and a subsequent fire that killed four of his five children. Even more unsettling are reports that Wanetta’s ghost has been spotted. That eliminates the logical suspect, surviving Hochstetler son, William. Burkholder’s search takes her deep into old archives and the present-day Amish community, not to mention that it unclosets a few local skeletons. It also keeps her busy at exactly the time that she fears Tomasetti will seek victim’s revenge on a rich punk implicated in his family’s murder, but freed on a legal technicality. Okay, so none of this rises to the level of the 1985 film Witness. And, yes, the overlapping family murders are more contrived than convincing. As mysteries go, this one isn’t hard to figure out; unless you believe in ghosts, there’s only one logical explanation. Nor can I praise the book’s literary merits. (Let’s just say the prose wouldn’t tax a teen.) It is exactly as I categorized it: a page-turner thriller to consume under a beach umbrella. Like that ice cream cone in the other hand, The Dead Will Tell is a guilty pleasure. You can repent by reading a Dickens novel on the treadmill when you get home. The Damnwells are Damn Good!